I love raising chickens. I have known people that buy chickens one year and then every year thereafter, they buy more chickens. That isn't necessary, however, with a little experience, I have raised chickens that sustain their own flock year after year. How Many Roosters Will I need? Which comes first, the chicken or the egg? That is an age old question, so we'll start our story with the egg. When choosing eggs to incubate, make certain you choose eggs from female chickens or hens that have free access to male chickens or roosters. You'll get eggs without a rooster, but you won't get chicks from eggs without a rooster. For every ten hens you should be one rooster. This way, you can guarantee good fertilization of the eggs. Putting eggs in an incubator or putting them under a chicken is called setting the eggs. 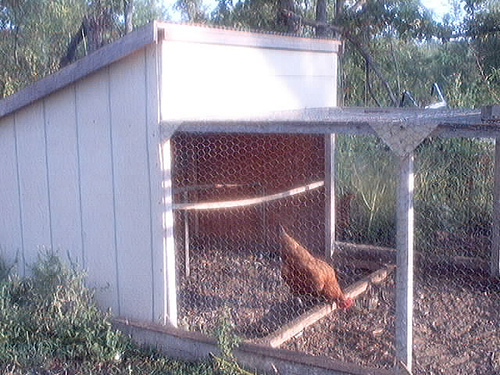 Eggs for setting can often be obtained through individuals who raise chickens. 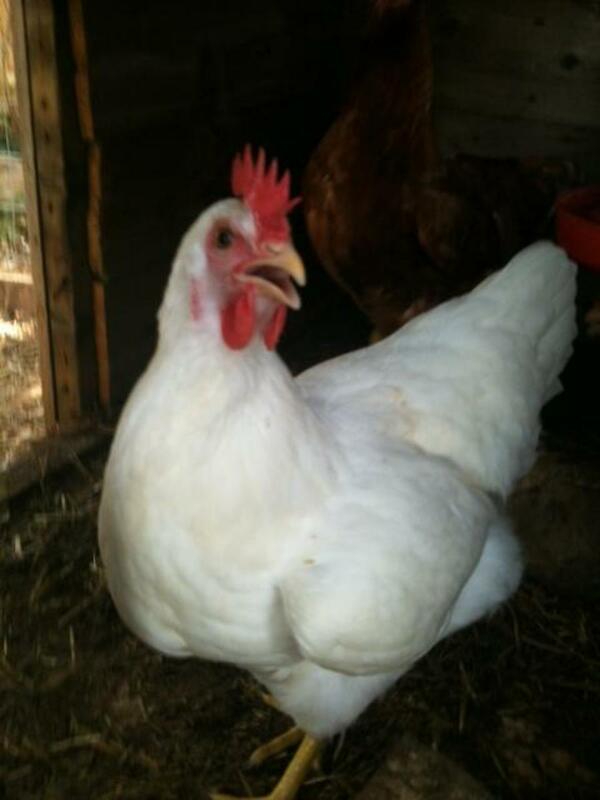 Just be certain that the person you are getting the eggs from have about as many roosters as stated above. Also, the eggs should be stored pointed end down and must never have been refrigerated. Eggs can also be found through chicken sites on line. The eggs should be as fresh as possible, less than a week old. Sanitation is also a an important factor. Use eggs from a clean source, but never wash the eggs that you plan to set because washing eggs can kill the embryo inside. Chicken eggs take 21 days to hatch and according to the Farmer's Almanac, chicks that hatch under a waxing Moon, in the fruitful signs of Cancer, Scorpio, and Pisces, are healthier and mature faster. Be certain that the incubator is as clean as possible before using. Clean off anything left from previous settings and spray with a bleach solution to disinfect. Allow to dry for a day or so in the open air to vaporize any bleach residue. 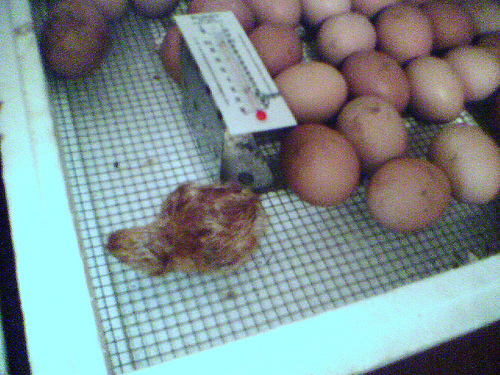 Preheat the incubator to the same temperature that a hen would keep her eggs at if she were hatching chicks. The temperature of an incubator with a circulating fan should be adjusted to about 100 degrees Fahrenheit. 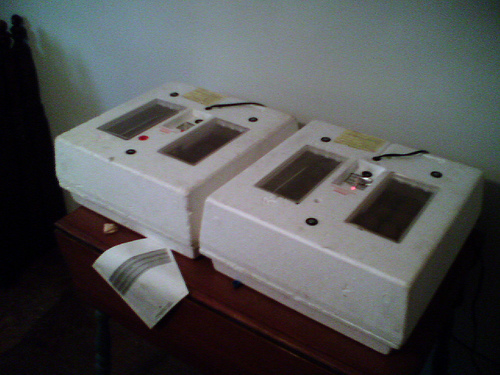 An incubator without an air circulating system required a constant temperature of 102. Do not allow the incubator's temperature to go above the 102 degrees. Slightly lower temperatures will not kill chick embryos, but higher incubation temperatures will weaken and kill chicks within 15-30 minutes. If you are fortunate enough to have an incubator with an egg turner, put the eggs into the incubator and start everything up. If however, you do not have an egg turner in your incubator, you will need to turn your eggs every six hours. To ensure that you do that every six hours, put an x one side of the eggs and begin with it at noon. Six hours later at 6 pm, the x will be down and at midnight, the x will be turned up again. That way, at 12 o'clock, the x will always be up and at six, the egg will always be down. This way, you won't have to remember whether or not you turned it. Because you don't want to turn the chicks in the same direction every time, turn the eggs to the left in the AM and to the right in the PM. Because the eggs will require humidity, be sure to keep the supplied reservoir filled with water to ensure adequate humidity. After the eggs have been in the incubator for several days, you will want to test them for fertility. Test white eggs on the third day and brown shelled eggs on the fifth or sixth day. An easy way to do this is hold the egg over a lit lightbulb. 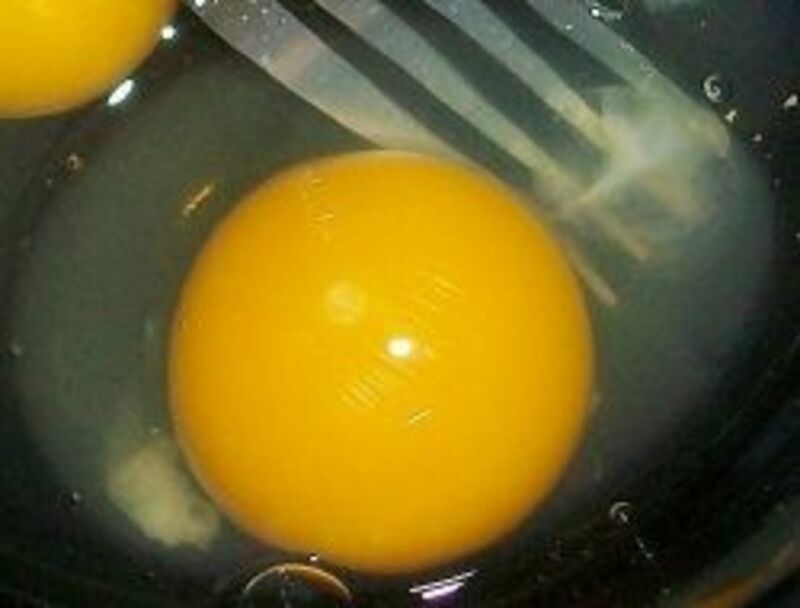 If you can see a spec of red inside the egg, the egg is fertile. If you cannot, the egg is not fertile and you should therefore discard the egg. Have you ever seen a chick hatching from an egg? On about the 18th day, stop turning the eggs and do not open the incubator. Within the next several days, the chicks will begin to hatch. Wait until each of the chicks have fully dried before removing from the incubator and placing them into a brooder. You do not want to help the chicks get out of their shells. In my experience, chicks who are too weak to get out of themselves, are too too weak to survive. 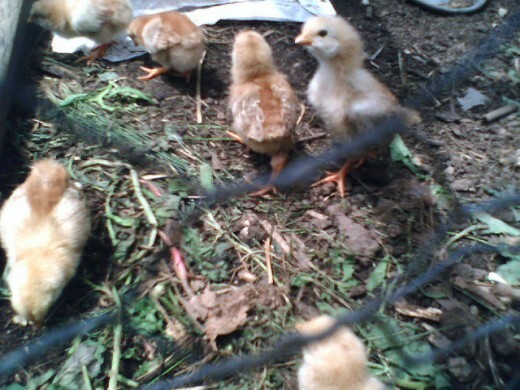 Once the chicks' down is replaced by regular feathers, and the chicks no longer need a light through the night, move the chicks to a more permanent outdoor pen. Keep these chicks away from bigger chickens so that the chicks do not come down with any diseases that the older chickens may have picked up. Begin giving chicks small weeds from the garden and household garbage to supplement their store bought feed. As the chicks get bigger, you will be able to give them courser foods, but keep it small when they are young so that they are able to peck at them and eat them. Up to a dozen chicks can be brooded in a cardboard box that is big enough for the chicks and their waterers and feed containers. 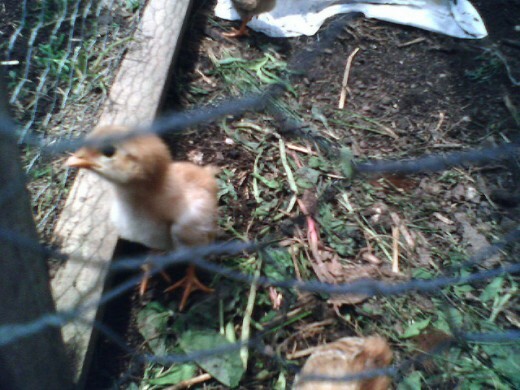 Add a screen or wire mesh cover to the box to protect chicks from predators. 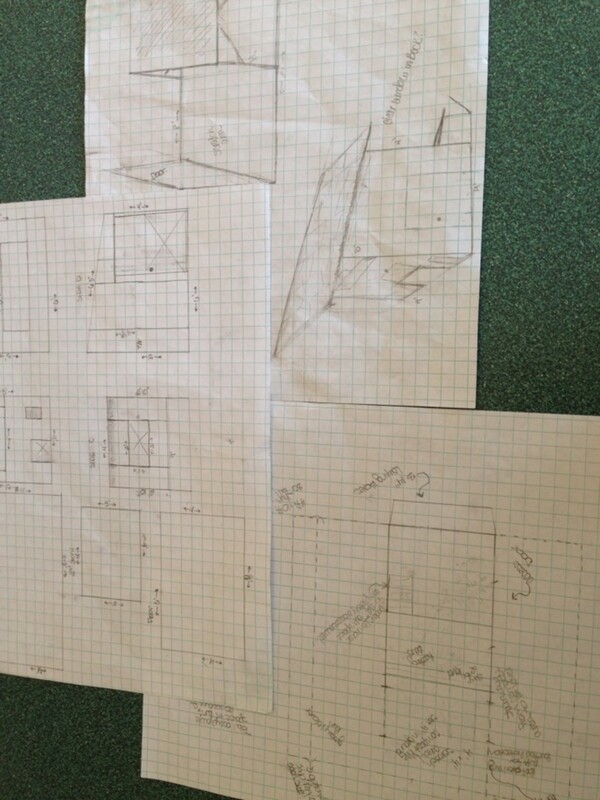 The walls of the cardboard box provide adequate protection against draft. a 65-75 watt bulb on a goose neck study lamp that can be adjusted inside the box to provide the chicks with more or less heat. During the first week you will be keeping the temperature between 90-95 degrees Fahrenheit. Every week you will be raising the temperature by about 5 degrees. You can also tell if the chicks are warm enough by how they behave. If they bunch up and cheep loudly, they are cold, so you will need to adjust the heat closer to the chicks. If they scatter away from the light, and stand with their beaks open and appear to be panting, then you will need to adjust the temperature lower because the chicks are too warm. 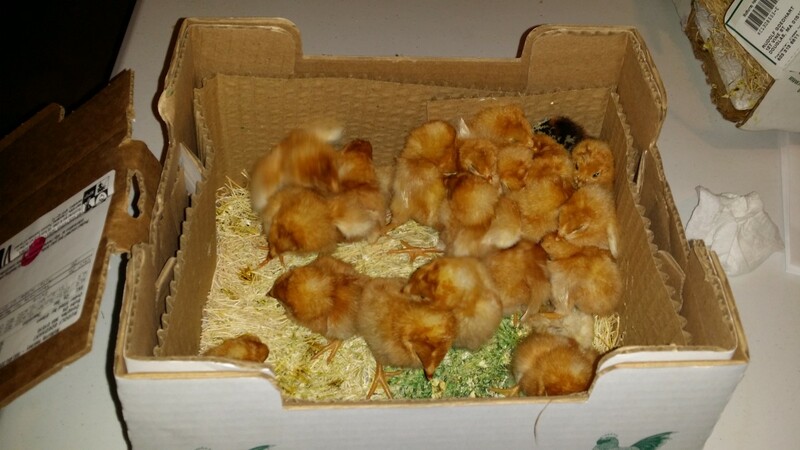 During the first couple of days, cover the bottom of the chick box with newspapers, but as the chicks get bigger, provide about 2 inches of litter material of wood shavings, chopped straw, paper, peat moss, or sand at the bottom of the box to keep it clean. Provide the chicks with chick feeders and chick waterers to provide them with a constant supply of food and water. 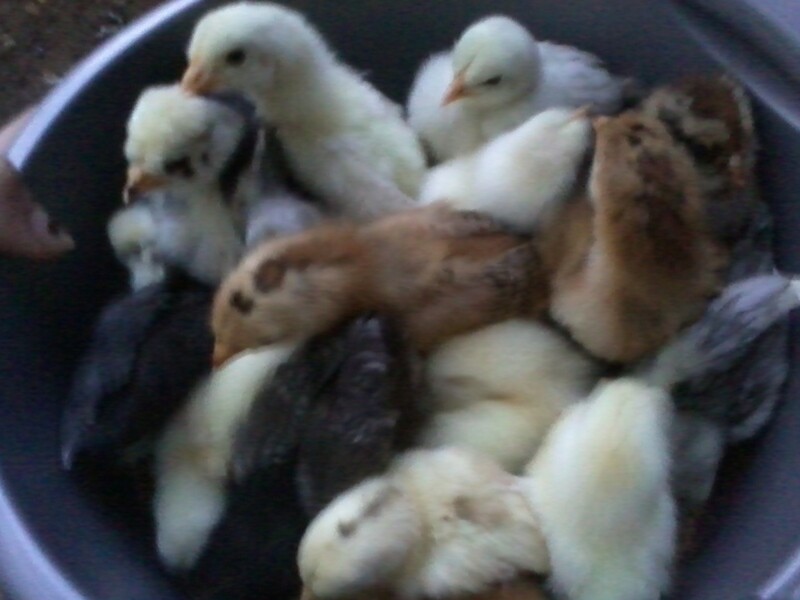 Buy chick feed, chick feeders, and chick waterers from the feedstore. At about the time the young roosters begin crowing around week 15 after they have hatched, put the chicks into their permanent adult pen. 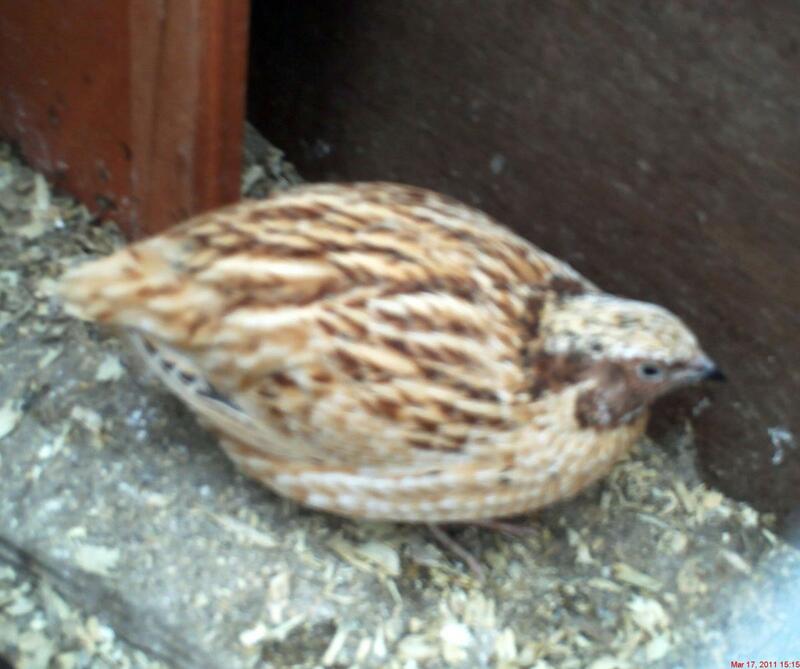 Give them roosts to perch on when they rest at night and give them nesting boxes in which to lay eggs. 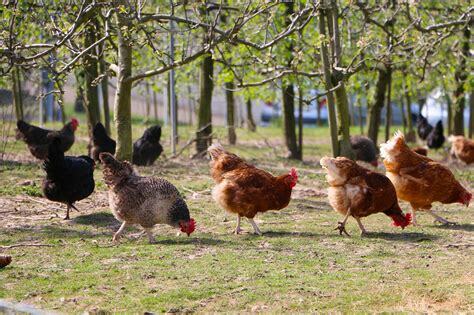 Depending upon the breed of chicken, the chickens will begin laying eggs between the ages of 18-30 weeks. Trade roosters that you grew with someone else who also raises chickens so that you can continue the egg hatching process without too much inbreeding. Keep water and food in front of them all the time. 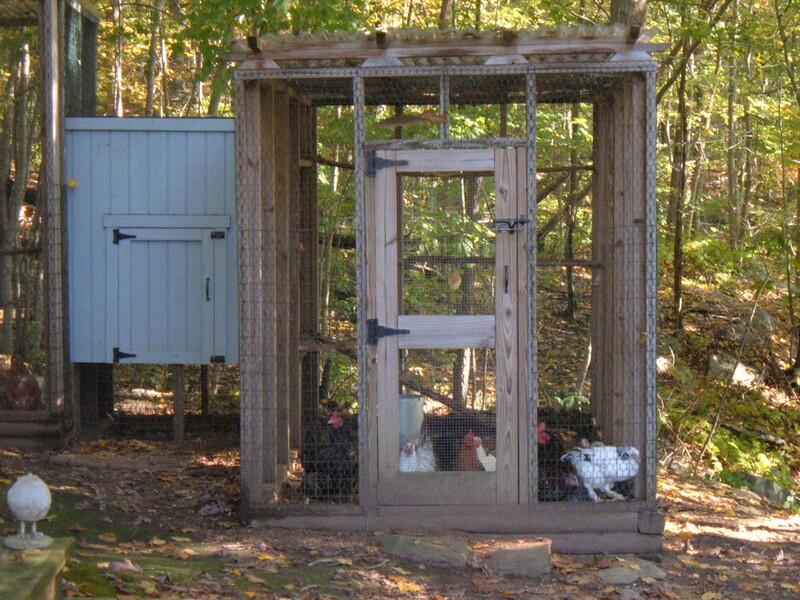 Protect them from wild creatures, and clean out pens every few weeks or do as I do and move the pen to another spot. Allow them to free range if possible. By continuing to do this year after year, you will have reached your goal of raising chickens year after year.. Thank Peg! If you have any questions, feel free to contact me with specific questions. This is a topic that I've been wanting to learn more about, Cygnet. Fantastic pictures of your group there, too! Thanks for the great introduction to the world of raising chickens. Thanks for the comment, billybuc. I find it amazing how creative people tend to gravitate toward natural things like raising chickens. Its as though being connected to the earth channels those creative juices. We've got six chickens right now but we bought them as chicks. We'll get to the point where we have an incubator eventually, but for now we are taking it slow and making sure we know what we are doing. Great fun raising chickens.